As you enter into this property you just know it: this is it. When they say a house is a home, this is the property they had in mind. 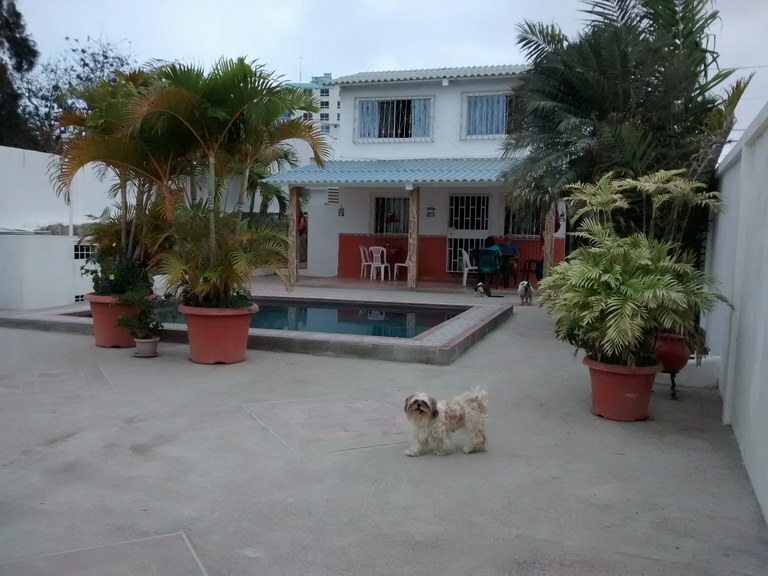 A one-story impeccably maintained house on a nice sized lot, located all of 2 short blocks to the beach in the La Milina section of Salinas. 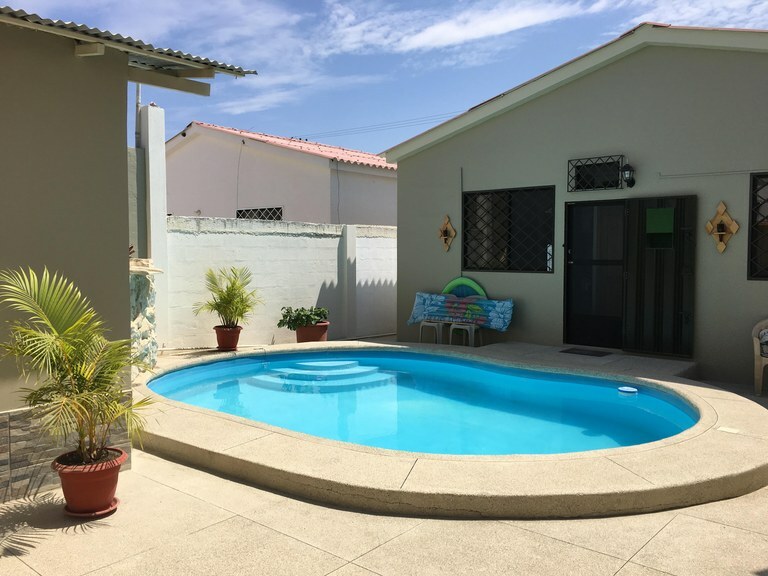 The house has 3 nice sized bedrooms, 2 full bathrooms, large living and dining areas, laundry area, as well as a remodeled american-style kitchen. The back patio can be accessed through the kitchen door, and is where you will find a nice sized in-ground pool, bar area, and detached one-bedroom suite. The front of the property boasts nicely manicured plants and flowers and a nice sized front porch. There is parking for 2 vehicles. The lot size is 310m2 and the house 120m2. Annual property taxes are under $200. This is a great home for anyone looking to vacation or retire to Salinas. Ever want to just walk to the beach just to see the sunset? How about sitting on your balcony to watch a sunrise? Or hearing the ocean waves as you go to bed? Perhaps you’ve always wanted a great entertaining space at home; or you a have a real green thumb you want to put to work at the beach. All of these wishes can come true in Cautivo!! This custom-built designer home of over 2000 square feet was finished in 2016 and fully supervised by its expat owners who ensured that American standards were met during the construction process. The lot is approximately 300 square meters and has a main entrance as well as a garage entry where there is space enough for two vehicles. The property has city water access, designated electric meter, fiber optic internet, a pressure pump, and a perimeter fence. The exterior of the property is like a lush garden of eden in a desert oasis. Many varieties of palm trees, mango, banana, and avocado all grow here. As does some real green grass and colorful bouganvilla. There is a separate covered area with outdoor pool table and plenty of space for entertaining. There is a large covered porch area which bridges the outside of the property to the amazing interior. As you enter the house the doors open up all the length of the house making for a grand entrance and the connection between outside-in. The entire downstairs is designed for entertaining in a large open space focusing around a custom entertainment center made with local-area materials such as beautiful stone. The gourmet open-concept kitchen has a great center island block with induction cooktop, huge oven, stainless steel extractor. The block doubles as a bar and eating table. There is a large pantry and there are plenty of cabinets as well as garbage disposal. The ceiling boasts local grown and treated bamboo, the floor a dark grey ceramic tile, and the counters a gorgeous marble. There is a nice desk area off to the side and there is also a visitor’s bathroom. Under the stairs is a nice size storage closet. Heading up the bamboo-accented stairway, upstairs there is a nice sized guest bedroom with walk in closets, ceiling fan and balcony access. 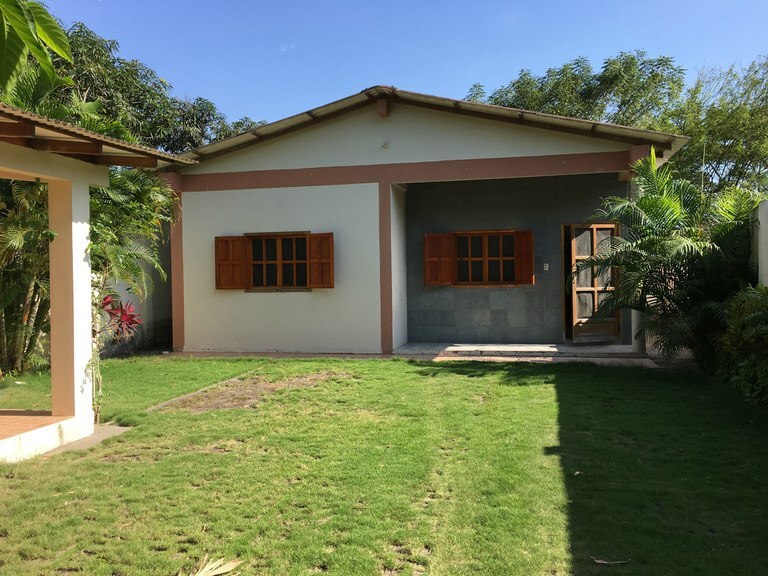 There is a large full bathroom in the hallway, as well as a laundry area tucked away behind great guaycan doors, in front of an open space which could house future additional storage. The master bedroom is a nice size and has access to the balcony which is enormous. The master en-suite bathroom is enormous and has a walk-in shower with tempered glass door, double bowl sinks, and a huge walk-in closet. The property is being sold unfurnished. Annual property taxes are approximately $100. **PRICE REDUCTION JAN 2019 from $270k to $257k** This house is a home. A very well maintained one. Downstairs is all open concept with a large living room, separate dining area, and eat-in kitchen with breakfast bar. There is a visitor’s bathroom, large pantry as well as laundry area. Downstairs there are two large bedrooms which share a jack-jill full bathroom. The kitchen has new deep double sink and new granite countertops. Upstairs is the master bedroom, followed by an enormous closet space which leads you to one of the largest and nicest master bathrooms with glass block throughout, his-hers sinks, linen closet and rain shower head. Just when you thought you were done, there is a door through the bathroom to an office space surrounded by windows which has a small Juliet balcony. The house sits on a lot that is 1000 square meters which also has a large 2 bedroom detached guest house plus a separate caretaker’s house. The entrance to the house is flanked by a large covered porch great for sitting and reading the morning paper while drinking your coffee. The pool and outdoor seating area is quite large and great for entertaining and is home to nicely landscaped trees and flowers. There is an enclosed one-car garage. There is currently fiber optic internet installed as well as a land line and direct tv is available if desired. The house is plumbed for hot water throughout and is on city water plus cistern with pump. There are three gas tanks used: one for the stove, the hot water heater and the clothes dryer. There is a septic tank on-site. The property has an electric fence with security system installed. The current owners have a caretaker who comes twice a week for $130/month for gardening and pool maintenance. 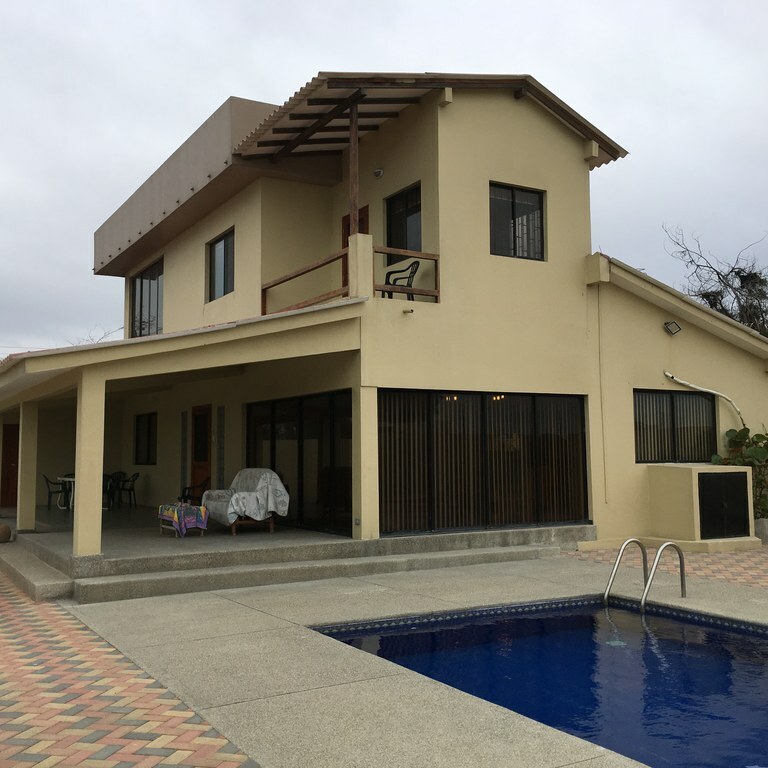 The property is located across the street from a large extensive beach and is less than a ten minute drive to the Salinas shopping mall and town center. The expat population in this small town is approximately 10-15 and growing. Buses come by every 15 minutes between 6am and 8pm. The property is being sold with all major appliances and furniture included. **3/14/2019 ~ JUST REDUCED FROM $159k to $139k!! 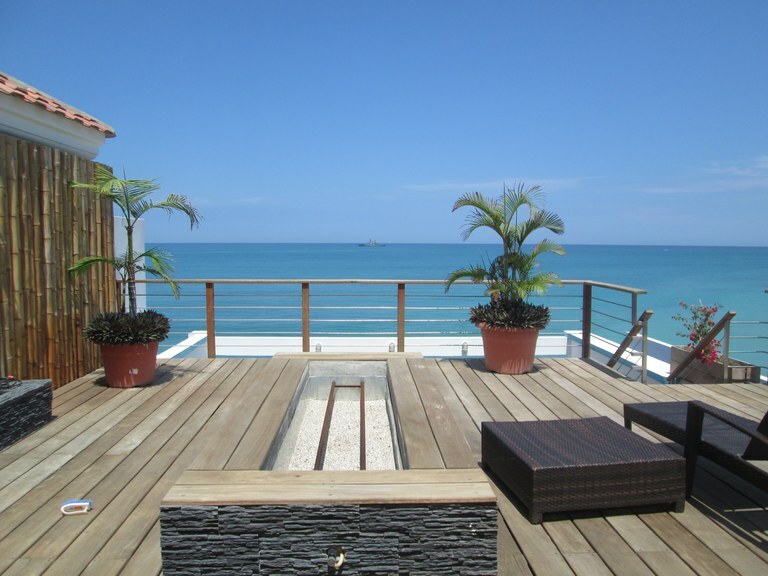 ** This is a fantastic find for anyone who wants to live and own a home directly on the ocean. 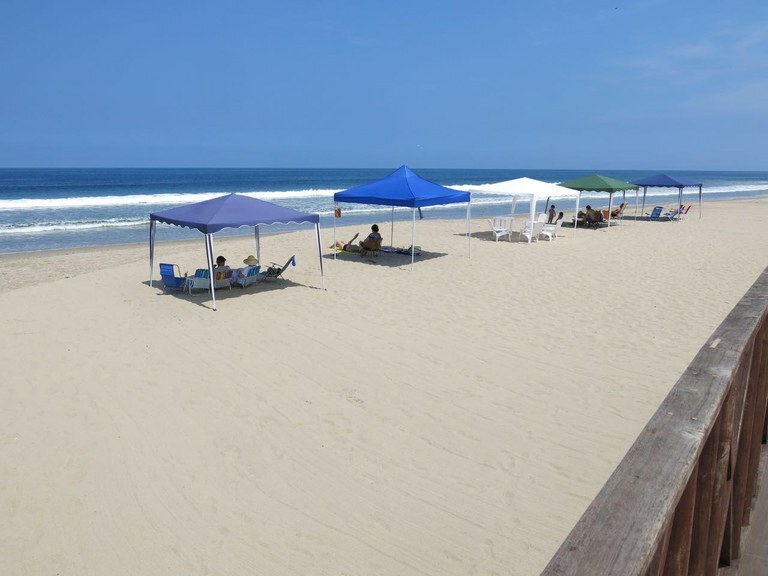 The two story home has been remodeled and updated yet maintains its cozy beach character. The outdoor seating area is fantastic for entertaining or just spending the day relaxing. On the first floor you enter into the living/dining combo all done nicely in wood and stone for a great rustic feel. Off the dining area is a nice open kitchen with breakfast bar. There is a visitors bath downstairs as well as a bedroom with own full bath. Out the kitchen there is access to the one-car garage and laundry/storage area. As you head up the wooden stairwell, you enter into a large open living space which doubles nicely as an office or small living room. There is a bedroom with access to a fantastic balcony here as well. The master bedroom also has balcony access and a nice walk-in closet and direct access to the upstairs full bathroom. The balcony is just fantastic for watching the waves and having your morning cup of coffee. 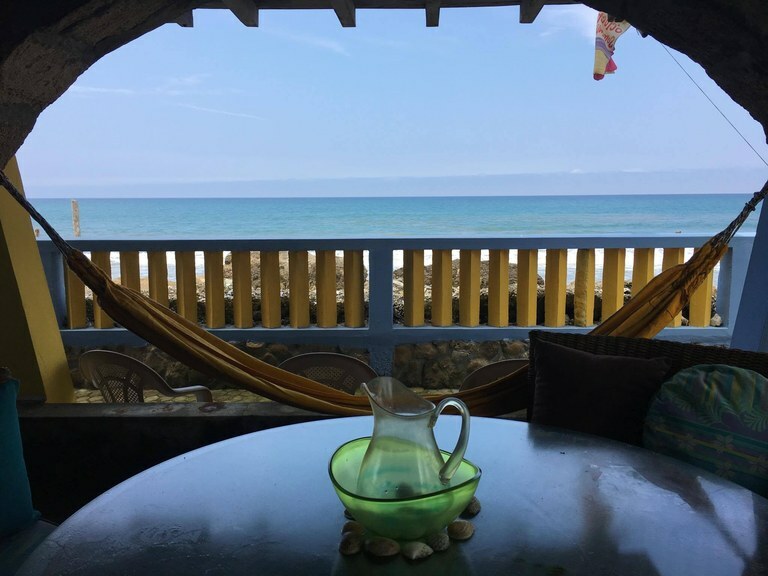 This cozy beach bungalow is nestled amongst the trees in the quaint town of Olón, all of 3 short blocks to the ocean. 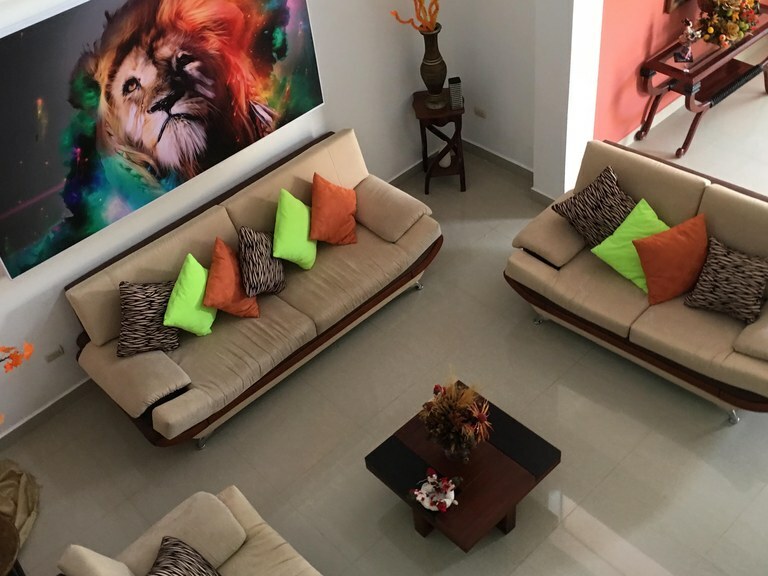 In a typical Ecuadorian beach home design, this one story cottage has 2 bedrooms, 3 full baths, and open kitchen, living & dining areas. There are no formal ceilings so the cottage remains cool and the scattered skylight areas on the roof allow for nice illumination throughout. The exterior of the property is what is really amazing with a huge yard with green grass, nicely maintained palms and plants, plus a large covered outdoor patio with bbq area; great for entertaining. A wonderful place for you to let your pets roam. 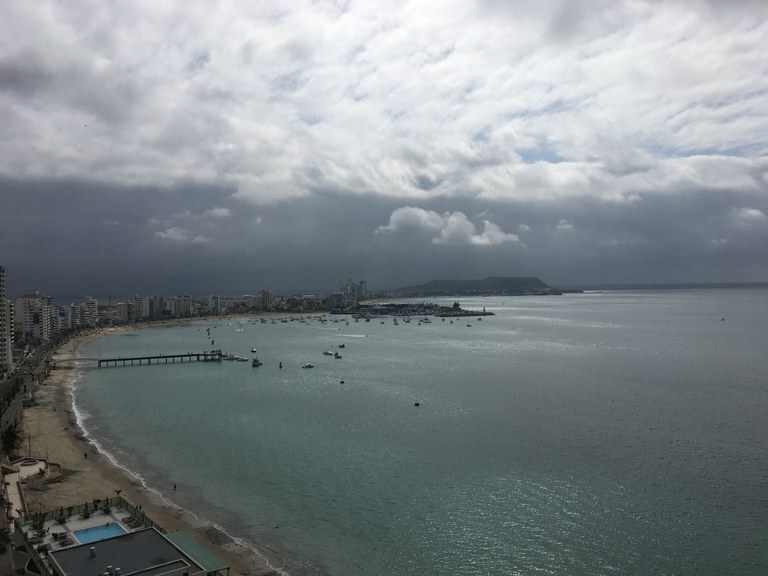 Olón is a very popular tourist destination and has seen an increased expat population over the past years due to its peaceful vibe and easy access to many local shops and activities. 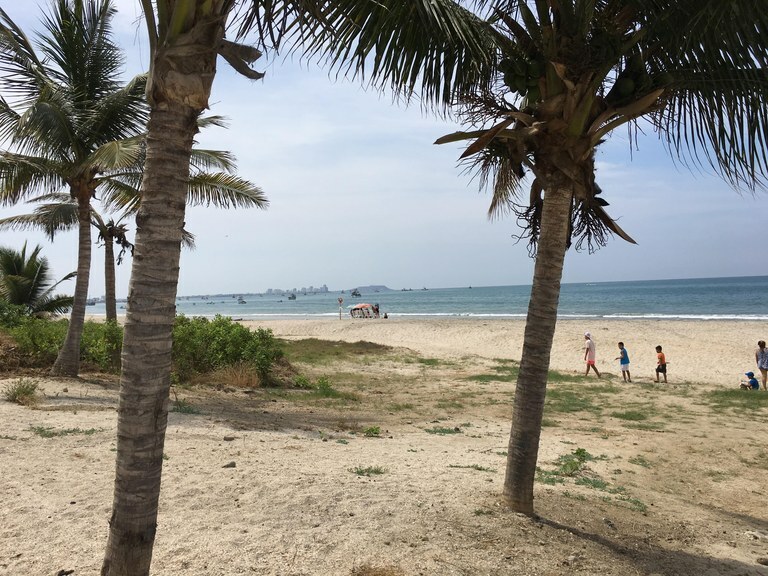 The beach is known country-side to be one of the best with a most expansive coastline with its walkable beaches and swimmable waters.